With her debut novel, Nikki on the Line, Barbara Carroll Roberts masterfully intertwines themes familiar to most middle grade readers--self-esteem, identity, changing friendships, risk-taking--into a thoroughly absorbing narrative. When she's playing basketball well, 13-year-old Nikki is truly in the zone: "Feeling the energy zing up from my feet all the way out through my fingertips, the ball sailing from my hand, the swish of the net...." Pure joy. This year, she's desperate to play on the prestigious Northern Virginia Action club basketball team. After Nikki makes the tryout cuts, her loving but harried single mom learns how much the club will cost and tells her no. Nikki promises to take care of her little brother Sam after school to cut down on childcare costs, to keep her grades up and continue to do her regular chores. Her mom relents, but once Nikki's playing on the team, none of this is as easy as she had hoped, not even her beloved basketball. Practices are grueling and for the first time ever, Nikki and best friend Adria are not the best players on the team. One of their teammates, Kate, is 6'2" and is already being scouted for colleges. JJ, another player, is brutally aggressive, with a sideline mother encouraging her daughter to bulldoze other players, barking, "Intense, JJ. Get intense." JJ plays mind games with Nikki, who has one green and one brown eye, by getting in her face mid-play and asking, "What's wrong with your eyes?" Although she's always been a confident girl, Nikki begins to doubt herself. Not surprisingly, her painful self-consciousness leads to faltering play on the court. Meanwhile, Adria and Kate have started spending time together, taking additional training classes that Nikki's mom can't afford. And when Kate's overbearing dad, who constantly pushes Kate to show up her teammates, comments that Nikki is a "black hole on the basketball court" who "doesn't belong in this league," Nikki falls apart. It takes all the resourcefulness this spunky eighth grader has to find her way out of her own personal black hole. The turnaround begins when she finally grasps what her coach means every time he quotes former UCLA basketball coach John Wooden: "Do not let what you cannot do interfere with what you can do." After a less-than-impressive report card and an injury to her brother on her watch, Nikki begs her mother to give her another chance to keep playing in the league. "I'm trying to do something I've never done before. You have to give me a chance to show Coach Duval that I won't let what I can't do stop me from doing what I can." Nikki is instantly recognizable as an everygirl for the 21st century. She is funny, thoughtful and awkward. She is clever and kind. She is scared of messing up--so scared, in fact, that she does mess up. But Nikki is also fortunate enough to have a rock-solid foundation of love and support, even if her librarian mother is perpetually baffled at her interest and ability in basketball, her brother is a noisy nuisance and her father is a "paper dad," or, as she tells Booker, "the guy who was the, um, the, you know, donor." Barbara Carroll Roberts is a graduate of Hamline University’s Writing for Children and Young Adults MFA program. She played competitive sports in high school and always wished there had been books in her library about athletic girls. 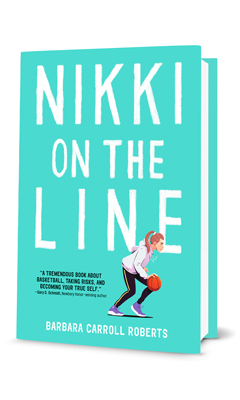 That desire--and the realization that there still aren't many books about girls who truly love sports--inspired her to write Nikki on the Line (available March 5, 2019, from Little, Brown Books for Young Readers). There are several distinct themes going on in Nikki on the Line: basketball, confidence, crushes, genetics. Did they emerge organically as the story unfolded, or did you set about including them purposefully? I had most of these thematic threads in mind when I began Nikki on the Line, though Booker emerged as I was writing. My aim was to write a story about a girl who is passionate about playing basketball, but who doesn't have all the genetic gifts to make her an obvious choice for every team. And since genetics is part of the middle-school science curriculum in many schools, it seemed like a natural thing to include. What was middle school like for you? Did you, like Nikki, have any big, embarrassing secrets? Middle school was a tough time for me, because my family was going through a difficult situation. I didn't share any of that with my friends. But I shared just about everything else with my two best friends--and now that I think about it, the three of us ran the 4x100 relay together on the track team. All these years later, those two women are still two of my very best friends. What inspired you to give Nikki a "paper dad"? If you spend any time around "sports parents," you know that some of them view their children's accomplishments as a reflection of their own athletic superiority. I didn't want Nikki to be in that situation (as Kate is). While Nikki gains some confidence from learning that her paper dad was a college-level athlete, her accomplishments are all her own. Also, it seemed to me that the words "sperm donor" would be excruciatingly embarrassing to many 13-year-old girls, which made it a good opportunity to add some humor. What were your favorite athletic endeavors as a kid? Were there other girls who shared your interests? I grew up in an outdoorsy family. We went camping and fishing for our vacations every summer. We hiked in the hills near our house and swam in the Pacific Ocean. I even remember my mother climbing trees with my sister and me. But my favorite activity was horseback riding. We never owned a horse, but my sister and I took riding lessons at a local stable for many years. I loved jumping the most--it was like flying. I began playing competitive team sports when I got to high school. I played several sports, but my favorite was field hockey. My best friends played field hockey, too. What were your parents like as sports parents? Were they like any of the parents in Nikki on the Line? My parents were not sports parents. I played competitive high school sports in the two years before and the two years after Title IX was passed, so girls' sports received no attention and virtually no funding. We played all our games right after school, and since my parents both worked, they couldn't come to games. In my senior year, my father took an afternoon off work one day to watch me play field hockey. I don't recall any other parent ever coming to watch a game. Were your children into sports? What were you like as a sports parent? My son and daughter played many sports--soccer, Little League baseball, roller hockey in our driveway, lacrosse and basketball. And I have to admit, I was occasionally a whack-job parent, especially if I thought the referees were letting a game get out of control and kids were getting hurt. But mostly, I hope my children would say I was a very supportive parent. Watching my son play lacrosse in high school and college gave me a lot of anxiety, because it's such a rough game and I was always worried about injuries. But like Nikki's mom, I also loved watching both him and my daughter play sports, because I could see how much they loved playing. Nikki takes some brave risks. What was the biggest risk you ever took? I tried to be a theater major in college. I hadn't been part of the theater crowd in high school (because competitive sports took up my time), but I loved old movies and thought I wanted to be an actress. But, wow, I was a terrible actress. I still have this recurring nightmare that I'm up on stage and not only do I not know my lines, I don't know what play I'm in. Fortunately, I also had the opportunity to write a play and have it performed while I was in college and, even more fortunately, I found the English department and started taking creative writing classes. You longed for more books about girls like you when you were a kid. What books that exist now do you wish had been available to you then? There are so many terrific books available to young readers today that I wish had been in my school libraries! Here are a few of my favorites: Dairy Queen by Catherine Gilbert Murdock (D.J. is the ultimate female athlete); The War That Saved My Life by Kimberly Brubaker Bradley (Ada is so brave and strong--and there are those wonderful horses); Millicent Min, Girl Genius by Lisa Yee (even though Millicent is a dreadful athlete, she's a girl who makes her presence known); One Crazy Summer by Rita Williams-Garcia (I love the way Delphine takes charge in her rapidly changing world). What kind of reader do you imagine will love Nikki on the Line most? 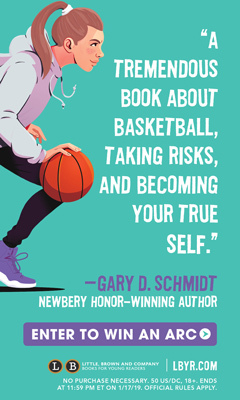 I wrote this book specifically for girls who love playing sports and I have to think they'll be the first readers to embrace it. 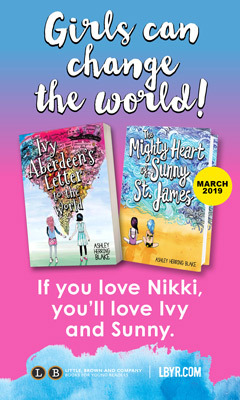 But I hope many other young readers (including boys) will find something to connect with in Nikki's challenges and perseverance. Is there anything else you would like to share with Shelf readers?